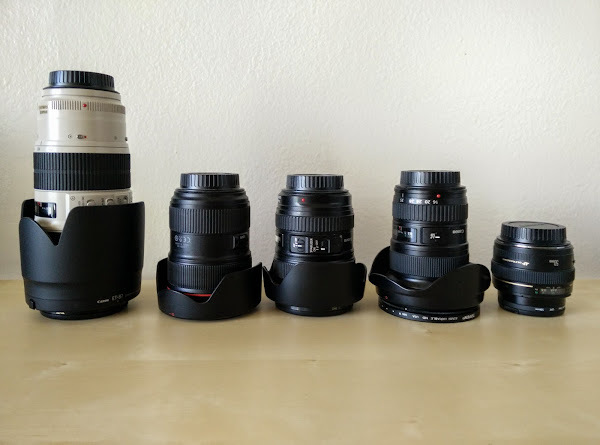 I primarily use and recommend Canon gear, and it’s not because I’m a Canon fanboy or anti-Nikon– it’s simply because I started with a Canon DSLR and just stuck with that since 2007. If I had started with Nikon, I probably would be using their products. Anyway, people often ask me for camera recommendations and I honestly don’t know what their needs or lifestyle is like to give them a single answer. However, I can make a list of camera gear I own that I would recommend. I started with a Rebel XT back in 2007. In 2011 I upgraded to a Canon 60D since I found myself in situations where I couldn’t see over the crowd I was in to take pictures, so the swivel LCD would be something of great use. 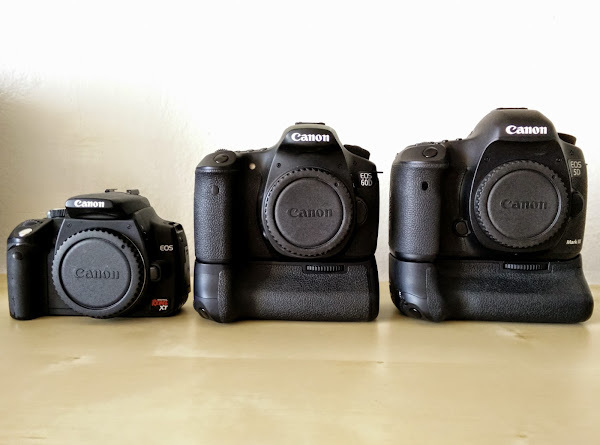 My main DSLR is the full frame Canon 5D Mark III, which I bring with me most everywhere. This is by far the best DSLR I’ve ever used and I am most happy with. I am a fan of battery grips for situations when I know I’ll be shooting a lot of portraits and/or when I’m shooting a lot of photographs throughout the day and don’t want to worry about swapping in fresh batteries. I have a BG-E9 that I use on my 60D, and BG-E11 for my 5DMIII. Luckily for me, they both use the same battery, the LP-E6. The main lens I use is the Canon 24-70mm f/2.8 L II. It’s my workhorse that I use most of the time since it’s incredibly flexible for most situations and the bokeh on it is amazing! My second favorite lens to use is the Canon 50mm f/1.4 prime. I didn’t like using a 50mm until I went full-frame. It’s small, it’s fast, nice bokeh, and decent sharp images. For my wide angle shots, my landscape and city/architecture, I like to use the Canon 16-35mm f/2.8 L II. It’s not great on people as it stretches those who are on the far left and right. Even with lens correction in post process doesn’t fix it without manual tweaks. For my secondary body, I put on the Canon 24-105mm f/4 IS L. This used to be my main lens, but I use it mostly for video because of the image stabilization. When I do event photography at conventions and shows, I absolutely love using my Canon 70-200mm f/2.8 L IS II. The images are just so tact sharp and the image stabilizer is amazing. I also use this for my portraits. I currently have two tripods. I have an entry-level tripod, a Dolica AX620B100 62-Inch Proline Tripod and Ball Head that’s very cheap. It’s not great for outdoor use and long/heavy lenses, but it’s great for indoor shots where the conditions are more controlled– no wind, water, or sand etc. The main tripod I use is the Gitzo GT2531 Series 2 6X Carbon Fiber 3-Section Tripod with G-Lock. I bought it with the Gitzo GH2750QR Series 2 Magnesium Quick Release Off Center Ball Head, which I personally find to be a bit odd to use. I love the Gitzo tripod, but the ball head I’d recommend you find something better, maybe something from Really Right Stuff. Some place do not allow me to set up a tripod, so I use a gorillapod instead. I use the one from Joby, which is also available with a ball head. My monopod I have the Manfrotto 560B-1, which is also useful for when they do not allow full tripods. The first flash I bought was the Canon Speedlite 430EX II. The second and main one I use is the Canon Speedlite 600EX-RT. 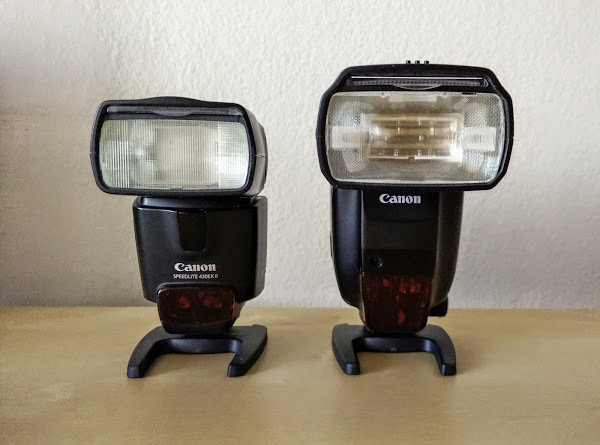 Both of the flashes use four AA batteries. I recently switched over to using rechargeable batteries to help keep costs down and conserve. I got the Sanyo NEW 1500 eneloop 8 Pack AA Ni-MH Pre-Charged Rechargeable Batteries along with SANYO 4-Position Ni-MH Rechargeable Battery Charger. For a diffuser, I used to be a fan of Gary Fong’s GFLSC01 LightSphere Collapsible Flash Diffuser, but I find it to be bulky and the results just okay. I now keep with me A Better Bounce Card. It comes in three sizes, which I keep with me the medium and large. For off camera flash transmitter, I have the Phottix Laso TTL Flash Trigger Transmitter for Canon. This works with the Canon 600EX-RT. For long exposures, I like to use a release cable. I use the SMDV Remote Shutter Release Cable. I also use Black Rapid Sports camera strap when I’m at conventions and events for fast access. I have another page where I have recommendations for camera bags. But in short, I recommend the Think Tank Retrospective 30.